On Friday, Air Finland flew more than 200 passengers from Stock­holm, Sweden, to Cambodia, making it the first time a commercial aircraft has undertaken a direct route from Europe to Cambodia. The Air Finland Boeing 757, which has a total of 219 seats, landed at Phnom Penh International Airport at 6:50 pm Friday with 215 Swedish and Danish passengers on board, according to Lynol Yi, managing director of Destination Asia Travel, which worked in cooperation with the Swedish travel agency Tui Nordic to facilitate the charter flight. Tourism and travel officials welcomed the historic flight as one that is bound to entice more European visitors and spur general growth in the tourism industry. But many also cautioned that more infrastructure development is needed for Cambo­dia to be fully prepared to host the increasing numbers of high-paying guests. Nine charter flights are planned before April 2008 with the next one due to land Dec 21, Lynol Li said. “Our idea is to promote our beaches,” he said, adding that about half the group that arrived Friday decided to take a bus to Siha­nouk­ville while the remaining tourists opted to stay in Phnom Penh for a few days before continuing on to Angkor in Siem Reap province. Tourism Ministry Secretary of State Sam Prumnear said that the number of Swedish tourists had jumped 45 percent this year, going from 9,323 in 2006 to 13,548 so far this year. Khek Norinda, spokesperson for the French company Societe Con­cessionnaire des Aeroports, which operates Cambodia’s three largest airports, welcomed the ar­rival of the Air Finland flight, saying that it could presage the ar­rival of greater numbers of Euro­pean tourists. Khek Norinda added that the onus is now on the rest of the tour­ism in­dustry to develop quickly to handle such an influx, but he warned against hastily throwing up hotels that might not meet tourists’ demands. “We don’t have enough international standard hotels, which means we are not ready to serve them,” he said of luxury tourists, adding that if the infrastructure is not improved, tourists risk having a negative experience. 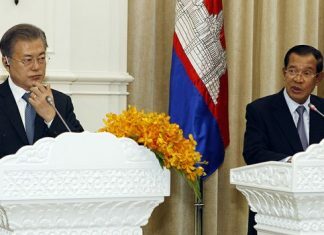 Sam Prumnear said that his ministry agreed with that assessment, at least in regard to Sihanoukville. “What we have to do is install in­frastructure and hotel facilities so they are ready to serve. 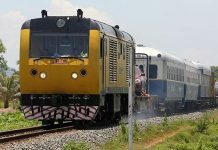 The hotel facilities in Siem Reap are enough, but in Sihanoukville there is not enough yet,” he said, adding that at least 1,000 more hotel rooms need to be built in Sihanoukville to meet the rising demand. “We have the market now, so I call for investors to come and in­vest,” he said, adding that the Tour­ism Ministry has developed a new “K4” masterplan focusing on Kep, Kampot, Koh Kong and Kompong Som—as Sihanoukville is also known. According to the Ministry of Tourism’s most recent report, the bulk of tourists still come from South Korea and Japan—a population that Han Rutten, director of the travel agency First Travel, said tends toward budget travel. Rutten, who has been working in the travel sector in Cambodia for six years, said that Western visitors more readily empty their pockets. “If you are stuck with budget travelers, the margins are so small and it is difficult to do anything good,” he said. 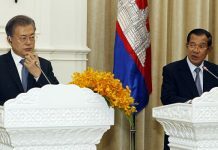 European and US travelers heading for Cambodia have until now had to connect through a major hub like Bangkok, and the costs of travel have reflected the extra mile­age, he said. The new direct flight will make travel to Cambodia from Europe less expensive, and the increase in interest from those areas could be quite substantial, he said. “For the industry in general, I think this is great news,” he said.